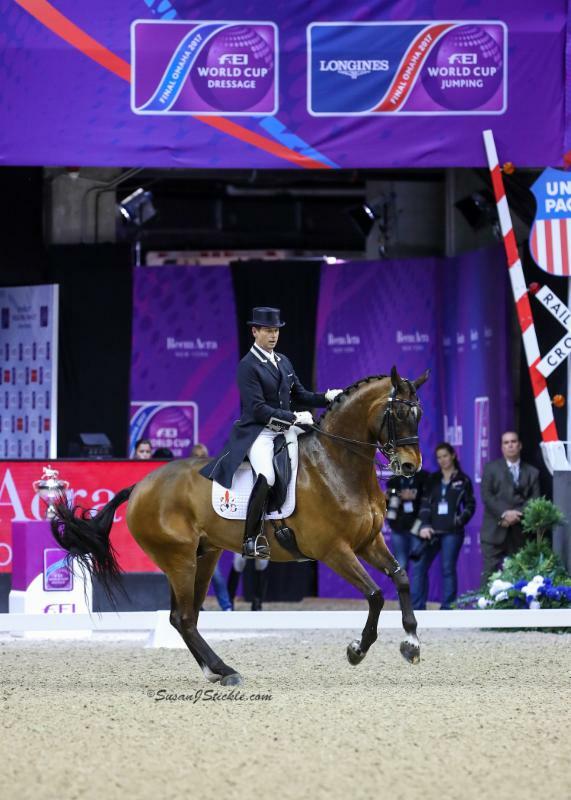 U.S. Rider Laura Graves places second and Great Britain's Carl Hester finishes third. Omaha, Nebraska - April 1, 2017 --Isabell Werth (GER), the most decorated rider in Olympic history, rode to an impressive score of 90.704% on her 2016 Rio Olympic mount, Weihegold OLD, to win the FEI World Cup™ Grand Prix Freestyle and claim her third FEI World Cup™ championship. 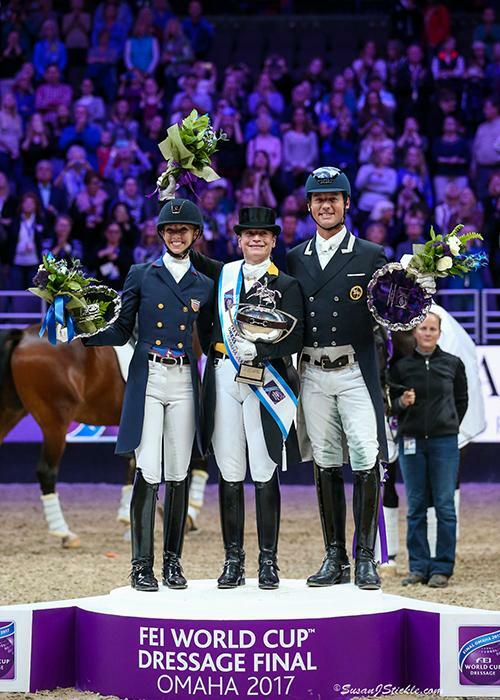 It was an afternoon of magnificence and music at the FEI World Cup™ Finals Omaha 2017. The air was electric at the CenturyLink Center as 14 horse-and-rider combinations performed choreographed Grand Prix Freestyle tests. The enthusiastic crowd applauded throughout Werth's test and rose to their feet at the conclusion of her brilliant ride. Emotions ran high at the awards ceremony as Werth was crowned Champion - and no one, not the competitors nor the 8,578 spectators, wanted the magical event to end. "Today was just perfect," said Werth. "I am really thankful and happy. The goal was to have the best competition here in the Freestyle at the end of the season and it worked. 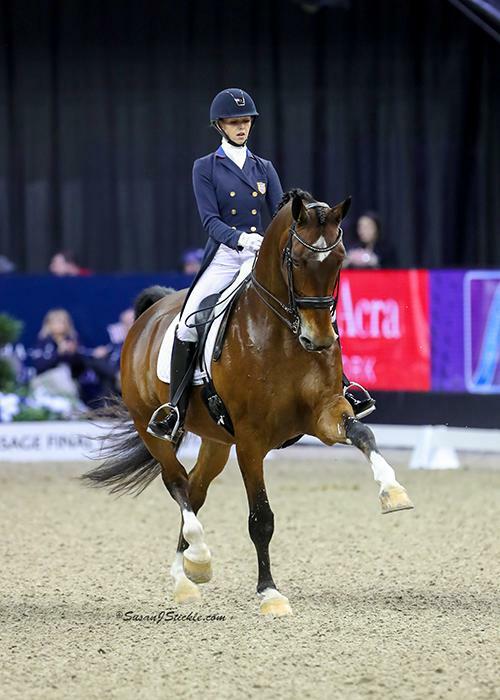 "I am really proud of Weihegold; she did really great. She was so focused. I think she knew that it could be her day today. Laura pushed us to show our best and it worked. It was a fantastic atmosphere, a fantastic competition, and a fantastic prize giving ceremony." Midway through the test, Werth broke into a huge smile. "She was really on," Werth said of the 12-year-old mare, owned by Christine Arns-Krogmann. "At the end, when Weihegold performed the piaffe-passage movement to the music, it was to celebrate her. I was really enjoying the ride, it was just fun." 2016 Olympic bronze medalist Laura Graves (USA) also broke into a huge smile as the crowd began to applaud midway through her test. She and her longtime partner Verdades rode to a personal best score of 85.307% for second place. "I could feel the crowd smiling the whole time," said Graves. "At the end of my ride I was super excited. I couldn't even hear my music once we broke into that extended trot so I had to guess on the final halt, but knowing that the crowd approved, especially in your home country, is amazing. "I didn't realize how badly I wanted to win. I'm very competitive. When I saw Isabell's technical score go so high and then they cut to a shot of the World Cup, I thought, 'Oh, I want that so badly.' To be honest, I was a little disappointed to know that I came in second, but coming second to Isabell, who's number one in the world, still feels an awful lot like winning. It was also my first time on a podium as an individual, so that is super special." 2012 Olympic team gold medalist Carl Hester (GBR), who finished third scoring 83.757%, believed that it was the best performance that he and his horse Nip Tick have ever had. "It was my favorite test. 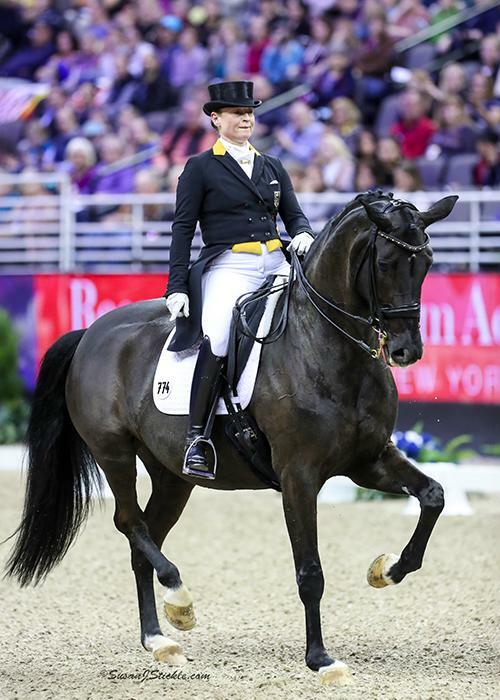 I find it quite unbelievable that he seems to not ever really make mistakes," Hester said of the 13-year-old Dutch Warmblood. "I think it was one of the best freestyles he's ever done. I was actually hitting every beat with the music in all the right places. For such a difficult test he made it incredibly easy to ride. He was just the best. "